1Head of department, Department of Oral Medicine and Radiology, Institute of Dental Sciences, Bareilly (UP), India. 2Post Graduate Student, Department of Oral Medicine and Radiology, Institute of Dental Sciences, Bareilly (UP), India. 3Reader Department of Oral Medicine and Radiology, Institute of Dental Sciences, Bareilly (UP), India. *Address correspondence and reprints request to: Prakash Chandra Jha, Post Graduate Student, Department of Oral Medicine and Radiology, Institute of Dental Sciences, Bareilly (UP), India. Panat SR, Jha PC, Chinnannavar SN, Chakarvarty A, Aggarwal A . Kocher Debre Semelaigne Syndrome: A Rare Case Report with Orofacial Manifestations. Oman Med J 2013 Mar; 28(2):128-130. Kocher Debre Semelaigne Syndrome is a rare syndrome with clinical manifestation of hypothyroidism associated with pseudomuscular hypertrophy. Very few cases have been reported on kocher-debre semelaigne syndrome in the literature with the incidence reported to be less than 10%. As per our knowledge; until now, only one case of oro-facial manifestations has been reported. 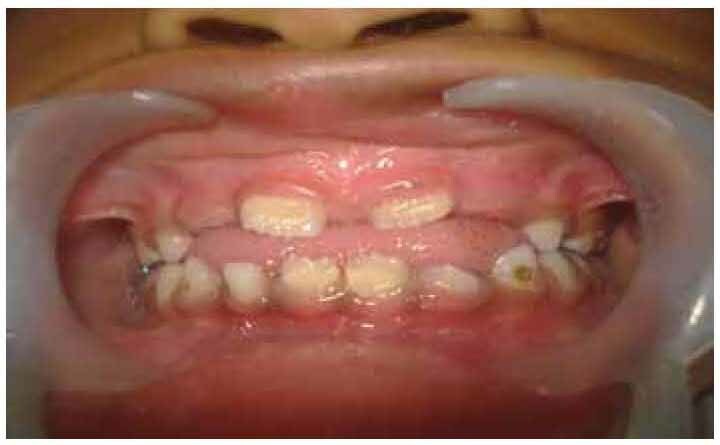 Here we report one such case of Kocher debre semelaigne syndrome in an 11 year old boy, showing features of macroglossia, multiple impacted teeth, puffed lips and anterior open bite. 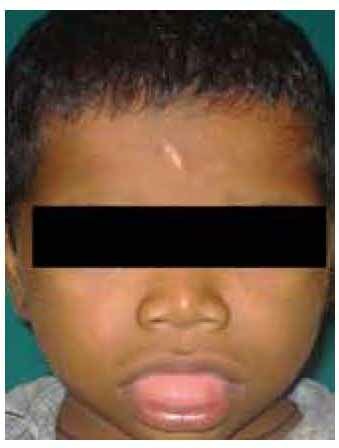 Keywords: Kocher Debre Semelaigne syndrome (KDSS); Myopathy; Hypothyroidism; Orofacial aspects. 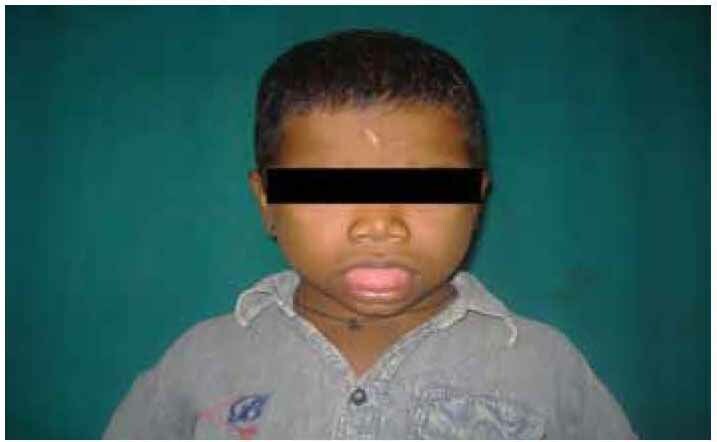 An 11-year-old boy (Fig.1), with severe congenital hypothyroidism was referred to the Department of Oral Medicine and Radiology from the Pediatrics Department, Rohilkhand Medical College, Bareilly (UP), for dental evaluation. The patient gave a history of reduced appetite, chronic constipation with hard stools, cold intolerance, delayed response to verbal commands and visual stimuli, since birth. The patient started speaking at 5 years of age and could only speak a few words. His family history revealed that he was the eldest son among two siblings; his younger brother passed away in an accident when he was two years old. Figure 1: Profile photograph of the patient showing short stature. On general physical examination, his pulse rate was 66/minute and his blood pressure was 80/60 mmHg. He had pallor, dry skin and coarse facial features. Beside this, he had features of short neck, umbilical hernia, coarse skin, incoherent speech and prominent calf muscles with proximal muscle weakness in the lower limbs (Fig. 2). Extra oral examination revealed that the patient had facial symmetry with the short stature (103) and upper/lower segment ratio of 1.5, rough hair texture, broad forehead with thick skin, coarse facial features, depressed nasal bridge, hypertelorism, and puffed lips (Fig. 3). TMJ and lymph node examination was unremarkable. Intra oral examination revealed that the patient had high arched palate and a protruding tongue (Fig. 4). Hard tissue examination revealed mixed dentition with permanent incisors, deciduous canines and molars in each quadrant. Teeth were conical in shape and deep carious lesion was present in relation to 54, 74, 75 and 85. The teeth in relation to 22 and 12 were congenitally missing. Based on these features, a clinical diagnosis of skeletal and dental malocclusion (class II) secondary to hypothyroidism was made. Figure 2: Photograph of the patients limbs showing prominent calf muscles. Figure 3: Extra oral photograph of the patient showing facial features. Figure 4: Photograph of the patient showing protruding tongue. 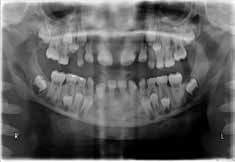 After clinical examination, panoramic and lateral skull radiograph were done. The panoramic radiograph demonstrated unerupted permanent canine, premolars and a second molar in each quadrant. Radiographic evidence of deep dental caries was evident with all the posterior teeth. Lateral skull radiography confirmed a class II skeletal profile and reduced dimensions of the facial complex. Other investigations, like complete hemogram, T3, T4, TSH levels, creatine kinase levels, and electromyography were done. The patient showed subnormal intelligence in the Binet Kamat and Seguin Form tests. Figure 5: Intra oral photograph of the patient showing congenitally missing 52 and 62. Complete hemogram showed normal picture. The levels of serum calcium, serum phosphorus, and serum alkaline phosphate were also within the normal limits. While T3 and T4 levels were significantly depressed (0.88 mg/ml and 1.8 μg/dl, respectively), and TSH was elevated (44 IU/ml). Creatine kinase activity was also increased (212 units/L). The electromyography findings were suggestive of myopathy. Ophthalmology consultation was taken for nystagmus evaluation; however, there were no evidence of nystagmus, but there was evidence of photophobia. On the basis of myopathy and muscular hypertrophy associated with congenital hypothyroidism, a diagnosis of Kocher Debre Semelaigne syndrome was made. The treatment for hypothyroidism was being conducted in the medical college (thyroixin replacement therapy, Eltroxin 100 mg/day since 2 months). The treatment plan was multidisciplinary, consisting of oral prophylaxis and topical fluoride application, pediatric endodontic procedures and interceptive orthodontic procedures. Kocher Debre Semelaigne syndrome is a rare condition of muscular pseudohypertrophy and long standing moderate to severe hypothyroidism in children.1 Congenital hypothyroidism is characterized by inadequate thyroid hormone production in newborn infants. Many infants with CH have co-occurring congenital malformations.13 Thyroid hormone deficiency contributes to 50% of acquired myopathies and is treatable.1,14 Clinical recognition of the disorder is important as it may be mistaken for primary muscle disorder. To the best of our knowledge, there have been only a few reported cases of Kocher Debre Semelaigne syndrome, and most of the reports have been in French. The usual age at presentation is between 18 months and 10 years, but the condition has also been diagnosed in infants and neonates. In the current case, the KDSS was diagnosed at 11 years of age to non-consanguineous parents.11,15 This could be due to the unavailability of medical care for the patient in his remote village. The pathogenesis of the pseudo hypertrophy in KDSS is not well understood. While the lack of thyroid hormone for a prolonged period of time impairs many metabolic functions of the body including musculoskeletal system; impaired carbohydrate metabolism leads to glycogen accumulation in the muscle and increased amounts of connective tissue and mucopolysacharide deposits in the muscle also gives the appearance of muscle hypertrophy. The pathogenesis of pseudo hypertrophy in our case could be the result of long standing hypothyroidism. The pseudo hypertrophy involves the muscles of the extremities, limb, girdle, trunk, hands, feet and the facial muscles and tongue as seen in our case, but it is more prominent in the muscles of the limbs (calf).11,15,16 The muscular hypertrophy (calf) and muscle weakness were observed on physical examination in our patient. Severe hypothyroidism, such as in the present case, can have deleterious effects on tooth development and eruption, and lead to prolonged retention of the primary dentition, subnormal growth of the maxilla and mandible with a marked reduction in the dimensions of the facial complex, and a lack of coordination between mandibular growth and dental development.10,17 The initial radiographic films of the patient including the cephalometric indicate that the growth of the mandible and the maxilla was severely impaired. The effect on the dentition was, to a great extent, limited to failure to exfoliate the primary teeth, delayed eruption of permanent teeth and distortion of the roots of the lateral incisors and first permanent molars. Figure 6: Orthopantamograph of the patient showing multiple impacted teeth. However, it was not possible to fully document this hypothesis because of an inadequate cooperation of the patient for a second set of cephalometric radiographs (Fig. 6). Electromyogram is usually normal or may show myopathic low amplitude and short motor unit’s potential (MUAPS). This myopathy is responsive to replacement therapy.18 In the current case, low amplitude and short MUAPS in the quadriceps muscle were apparent on the EMG. Kocher-Debre Semelaigne syndrome is a specific, rare form of hypothyroid myopathy, which causes hypertrophy of muscle. However, the lack of awareness about hypothyroidism among primary healthcare practitioners, as well as the high cost of and unavailability of the necessary laboratory investigations act as limiting factors in the diagnosis and management of hypothyroidism in our country. Unfortunately in the present case; due to the poor socioeconomic status, the patient did not turn up for follow-up. The authors reported no competing interests and no funding was received for this study. 1. Tullu MS, Bavdekar SB. Kocher-Debre-Semelaigne syndrome. In: Recent advances in pediatrics, Gupta S ed, Special volume on Pediatric Endocrinology, 2004; 13:159-162. 2. Luiz N. Kocher-Debré-Sémélaigne syndrome. Indian Pediatr 1998 Nov;35(11):1115-1116. 3. Rajvanshi S, Philip R, Gopal K, Rai K, Gupta K. Kocher-Debre-Semelaigne syndrome. Thyroid Res Pract 2012;9(2):53-55. 4. Singh M, Aram GN, Azamy S, Arya LS. Kocher-Debre-Semelaigne syndrome. Indian Pediatr 1983 Feb;20(2):149-150. 5. Khatua SP, Gangwal A, Khatua S. Kocher Debre Semelaigne syndrome. Indian Pediatr 1984 Apr;21(4):337-339. 6. Yeshwanth M, Benakappa DG, Gautham KS. Kocher Debre Semelaigne syndrome. Indian Pediatr 1987 Apr;24(4):346-348. 7. Uzun H, Targan S, Çorumlu O, Aktaş A, Atlihan F. Report of Two Cases of Kocher-Debre Semelaigne Syndrome. Düzce Tıp Fakültes Dergisi 2005;3:25-27. 8. Mehrotra P, Chandra M, Mitra MK. Kocher Debre Semelaigne syndrome: regression of pseudohypertrophy of muscles on thyroxine. Arch Dis Child 2002;86:224a . 9. Klein I, Levey GS. Unusual manifestations of hypothyroidism. Arch Intern Med 1984 Jan;144(1):123-128. 10. Klein I, Mantell P, Parker M, Levey GS. Resolution of abnormal muscle enzyme studies in hypothyroidism. Am J Med Sci 1980 May-Jun;279(3):159-162. 11. Patney A, Pai KM, Sholapurkar AA. Kocher Debre Semelaigne syndrome and associated orofacial aspects: report of a case. J Oral Sci 2011 Mar;53(1):129-132. 12. Kapoor A, Kapoor A. "Kocher Debre Semelaigne Syndrome" - A Case Report. People’s Journal of Scientific Research 2009;2(1):13-16. 13. Razavi Z, Yavarikia A, Torabian S. Congenital anomalies in infant with congenital hypothyroidism. Oman Med J 2012 Sep;27(5):364-367. 14. Virmani A, Gambhir A, Iyer PU. Kocher Debre Semelaigne syndrome mimicking primary muscle disease. Indian Pediatr 1990 Jan;27(1):88-89. 15. Bhide MP, Khare MD, Jaykar AV, Ranade AY, Patnekar PN. Kocher-Debre-Semelaigne syndrome. Indian Pediatr 1989 Oct;26(10):1049-1052. 16. Shaw C, Shaw P. Kocher-debre-semelaigne syndrome: hypothyroid muscular pseudohypertrophy-a rare report of two cases. Case Rep Endocrinol 2012;2012:1. 17. Bedi R, Brook AH. Changes in general, craniofacial and dental development in juvenile hypothyroidism. Br Dent J 1984 Jul;157(2):58-60. 18. 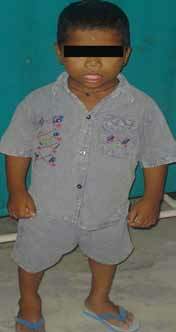 Miniyar S, Kulkarni R, Valvi C, Kinikar A. Kocher-Debre-Semelaigne Syndrome. Bombay Hosp J 2011;53(3):662-664.